Laura Punaro, owner of Frontlines CPR, became motivated to start this company when her own daughter choked when she was only ten months old. She knew what to do because she had been trained in infant CPR and choking. She just kept thinking about what could have happened if she didn't know the life saving skills she had been taught. She knew the answer. For that reason, she started Frontlines CPR. Laura has worked as a Pediatric Intensive Care Unit Nurse for eight years. She attended The University of Virginia School of Nursing and began her career as a Pediatric Intensive Care Unit Nurse at Children's National Medical Center in Washington, DC. After working at Children's National Medical Center she transitioned to Georgetown University Hospital. Laura is a Certified Instructor for the American Heart Association. 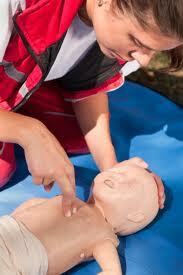 Frontlines CPR is dedicated to teaching people the skills required to save a life. The company offers both private and group classes, making it possible for anyone to get the training they need. Frontlines CPR is focused on teaching expecting and existing parents as well as anyone who cares for infants and children. In addition, there are a variety of other classes available that are geared towards anyone who requires a certification for their job.